My first experience at Rush Street plodded along rather ill-informedly. It was the most honest visit of any kind – on my own dime and to meet a girlfriend over lunch. I ordered the salad. Big mistake. I had no idea at the time that the restaurant was a reference to the cultural and historic district in Chicago – with Northwestern alumni cheering in the upstairs viewing area on Saturdays to prove it. I don’t order the salad in Chicago. Rush Street is the kind of place you leave with leftovers. 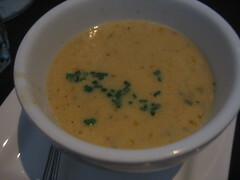 Maybe the breakfast burrito and the corn chowder were too much but you couldn’t not get the corn soup. It’s hearty and just the sweet you need to prep for your salty, savory brunch entree. 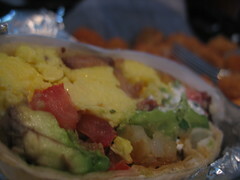 The menu is divided into three different themes: The Morning After (egg and breakfast dishes), Nooner Indulgence (burgers, hot dogs, salads and sandwiches) and The Brick House (pizza). Cute. Good thing the entire menu is available until 3PM on Saturdays and Sundays so you can delay your “after” to noon. 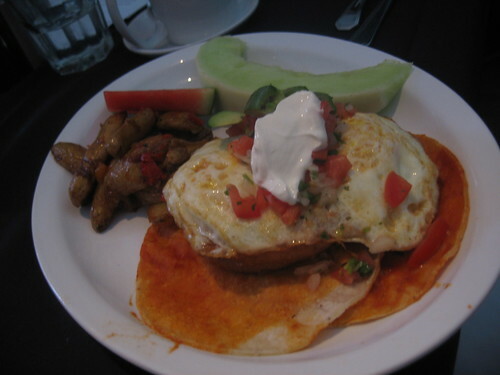 You can also customize your egg dish to how you like, with a “build your own omelet” option – served with breakfast potatoes or tater tots. 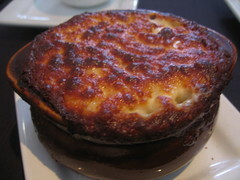 The mac ‘n cheese comes in a little pot complete with a baked-over layer on top. It’s really the only way you imagine mac ‘n cheese properly being serve: Baked to the finish. Eat this side dish right away – it’s not fair if you get served too much food and let it sit long enough to let the cheeses slightly separate. *wink* 😉 It’s just so pleasantly cheesy! I’ve heard the pizza is consistently good at Rush Street but Maya’s better half, Rory, noticed the pizza was on a flatbread during brunch in contrast to the regular pizza crust it is prepared on for the dinner menu. 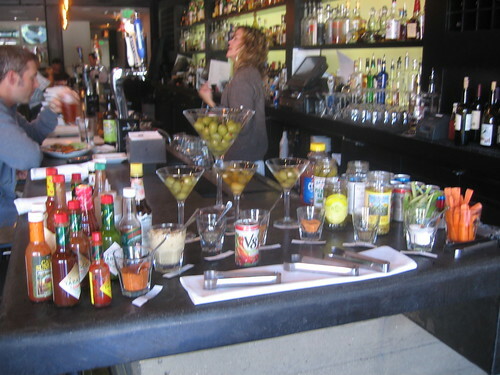 Since we were on the brunch tip, I thought it a good idea to dive right in – to the Bloody Mary Bar ($10). It’s a sight to behold – a cluster of seasonsings and saucesÂ situated facing the entrance and taking up the entire end space. Expertise is unnecessary when ordering a Bloody Mary made with Ketel One (coincidentally my personal preference when it comes to vodka, but you can request what fits you) ; it’s a mysterious concoction a sense of adventure could easily rectify. To start, there are three tomato juices to choose from: V8 Vegetable Juice, Campbell’s Tomato Juice and the ever elusive Clamato. I chose the latter and wasn’t disappointed. There are a ton of ingredient addition options and garnishes to choose from. It may be hasty of me to judge so quick, but this brunch experience has reaffirmed the “don’t order salad here” rule I learned on my first visit. With allegiance to my Midwestern roots, Rush Street also features a $10 brat, fries and PBR can special until 3 PM. I’ll just have to return to try that one out – when I get my second wind. This entry was posted in Culver City, Food and tagged bloody mary bar, Brick House, brunch, corn chowder, Culver City, huevos rancheros, mac & cheese, Morning After, Nooner Indulgence, Rush Street. Bookmark the permalink. ← This Weekend: Beach Cleanup, BevMo!, Beer…and Kitty. And Food.